15 Days. 15 Matchups. 15 Winners. 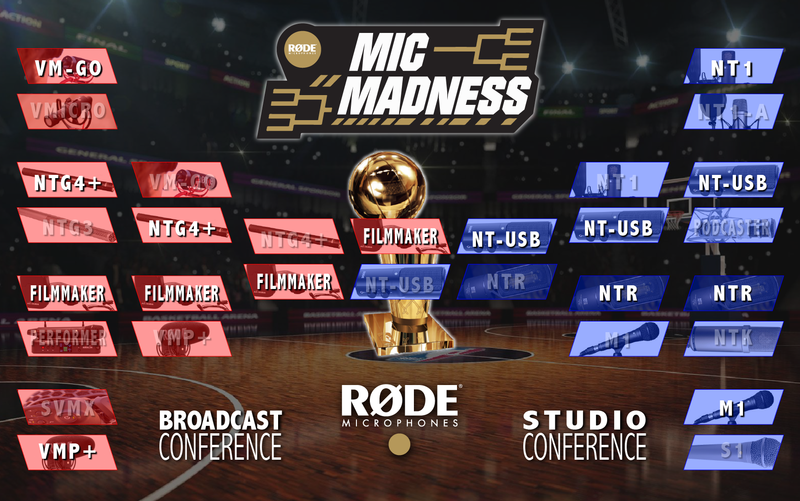 Get Ready for RØDE MIC MADNESS! For the next 15 days in March, RØDE are kicking off the biggest head-to-head, knockout round, giveaway the company has ever seen! Each day two RØDE Mics will go head-to-head in a public vote challenge. The winning mic moves on the next round, and if YOU voted for the winning Mic, you could WIN that RØDE Microphone - FREE! Voting is via the panel below, or RØDE's Instagram Stories, every single day! The Competition has ended - Congratulations to the MIC MADNESS WINNER - The RØDELink Filmmaker Kit! Check back each day to VOTE for the next matchup, and see if you have WON! Round One - The VideoMic GO defeated the VideoMicro and progresses to the next round! WON by Robert Friedrizsik of Germany. Congratulations Robert! Round Two - The NT1 took home a wire to wire win over the NT1-A. WON by Matt Oglesby of the UK. Congratulations Matt! Round Three - The NTG4+ caused an early round upset against the legendary NTG3. WON by Matthew Hall of the USA. Congratulations Matthew! Round Four - The NT-USB never looked like losing against the Podcaster! WON by Rachel Yancey of the USA. Congratulations Rachel! Round Five - The Filmmaker Kit had a convincing win over the Performer Kit! WON by Catalina Alejandra Acevedo Pacheco of Chile! Congratulations Catalina! Round Six - The NTR Ribbon Mic put on a clinic against the NTK Valve Mic. WON by Florian S of France. Congratulations Florian! Round Seven - The crowd favourite VMP+ put the SVMX on a poster with some big time plays! WON by Matt McKechnie of Australia. Congratulations Matt! Round Eight - The M1 Dynamic Mic won easily over the S1 Condenser Mic and moves on to the semis! WON by Andrew Flint of the UK. Congratulations Andrew! Broadcast Quarter Final 1 - The NTG4+ continued it's impressive run and moves on over the VideoMic GO. WON by Ryan Silber of the USA! Congratulations Ryan! Studio Quarter Final 1 - The NT-USB took home a huge upset win over the NT1! WON by Chakrabhat Leinsiri of Thailand! Congratulations Chakrabhat! Broadcast Quarter Final 2 - The Filmmaker Kit continued it's deep run in the post season defeating the top seeded VMP+! WON by Morgan Bell of the USA! Congratulations Morgan! Studio Quarter Final 2 - The NTR moved on to the Conference Final over the M1 Dynamic Mic. WON by Rodrigo Mendoza Ruelas of Mexico. Congratulations Rodrigo! Broadcast Final - The Filmmaker Kit continued it's perfect run into the Finals over the NTG4+! WON by Brandon Hendricks of the USA! Congratulations Brandon! Studio Final - The NT-USB has booked a ticket to the FINAL by deafeating the NTR Ribbon Mic! WON by Amir Zonozi of the USA! Congratulations Amir! Final - The RØDELink Filmmaker Kit wins the Championship over the NT-USB! WON by Daniel Sifontes in Spain. Congratulations Daniel!